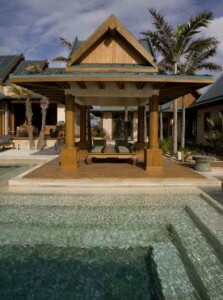 In SANSKRIT, NANDANA means “paradise.” it’s the perfect appellation for this tropical home. For the client, the dramatic elegance of the Amanpuri resort in Phuket, Thailand exemplified the very notion of paradise, and provided inspiration for this particular project. although British colonial architecture is the staid and pervasive style that has achieved dominance throughout the Bahamas, this client desired the scale of smaller pavilions, layered roofs, and an exotic ambience—in other words, a drastic departure from British colonial. 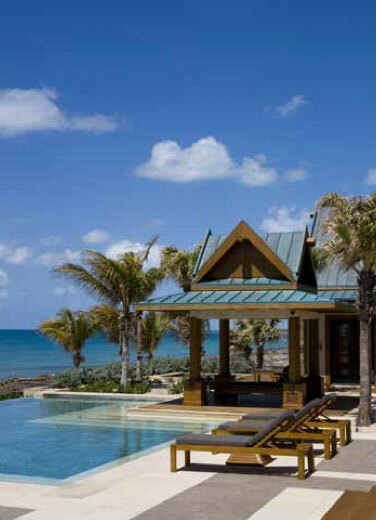 This private villa, located on one of the premier oceanfront properties in Old Bahama Bay resort in the grand Bahamas, was completed in 2006 in association with hart howerton. i was the design principal during the conceptual and design development stages. The home accommodates the lifestyle needs of the owner and functions as a rental villa in the international luxury resort market. Raising the home considerably above beach level provided an opportunity to create a striking presence as well as a sense of privacy and separation from the beach. Organized around a architectural 120-foot- long pool, the main gathering area and five bedroom suites have a village-like presence in both scale and organization. Two 1,000-square- foot master suites anchor the compound at each end. The property is bounded in the front by the ocean and a protected sandy beach, and in the rear by a deep water canal with private docking for yachts. The architectural detailing offers a continuation of the Thai design style in the exterior and interior, contributing to the desired exotic atmosphere with artistry and meaning. Soaring roofs provide the home with dramatic interior volumes, and the use of tropical hardwoods on the ceilings and walls, fill the interior with the mood of a restful and tropical sanctuary. so the triangulation between humanity, buildings, and earth creates an indelible link between natural and built environments. The tradition of sacred architecture in many cultures (such as the ancient indian Vaastu, a system of design and construction based on natural law) emphasized that a home was not merely a dwelling place; it was where the most intimate rituals were enacted. Specific configurations were believed to be indelibly associated with our emotional, physical, and spiritual well-being. in this manner, a home becomes a microcosmic reflection of our relationships to the larger community, to nature, to our innate creativity, and to our own evolution as a species. The architect is tasked with a major responsibility in the creation of built environments, which are not merely functional frameworks for human activity, but manifestations of the highest principles of a society or culture. The role of designing and constructing homes, and buildings of importance, is just as invested in revealing our aesthetic and compositional sensibilities (which are intrinsically connected to spiritual and philo- sophical beliefs) as it is in meeting utilitarian needs. although the ritualistic connotations of our structures are not overt in contemporary life, most of us have a general understanding of how our built environments affect and move us, and how they are capable of re- vealing our connection to the larger environment.